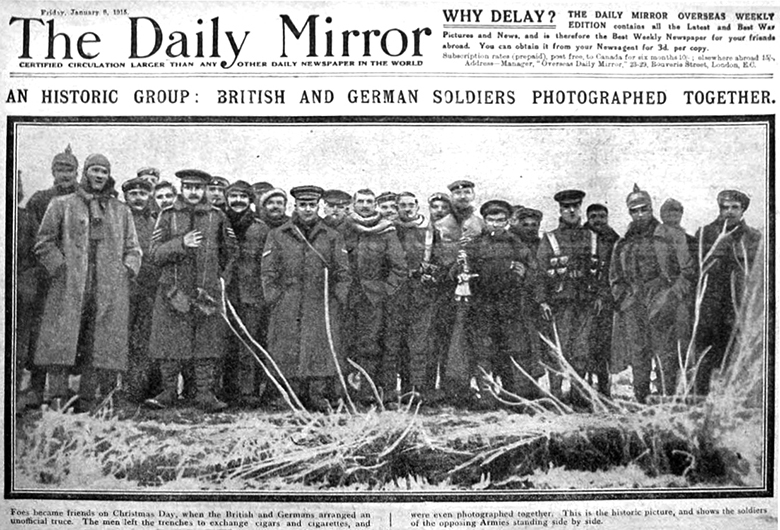 Almost two years after the Christmas Truce of 1914 (captured in the above photograph published in The Daily Mirror, 5 January 1915), the following story first appeared in the Adelaide Chronicle attributed to James Fisher. We felt such an eloquent and poignant piece to be worthy of reproduction in its entirety to allow us a brief glimpse into the experience of Christmas for those in the trenches of the Great War. It is Christmas Eve in a trench somewhere in France. We had entered in the dark of the early morning and are to keep our Christmas in watching and warding the Huns, who lie in wait only a short distance in front. The season has cast its spell over our minds: home thoughts and memories of Christmas times long past crowd upon us. Visions of happy faces and children doubtfully expectant of Santa Claus in the absence of dads at the front haunt our imagination. What a cruel contrast to the peace of the season are the distant patter of a machine-gun and the occasional sputter of rifle-fire. We feel, somehow, that- we are again sinking into the primeval man, for we occupy the depths of the earth and are insensible alike to cold and heat. Yet we recollect that it is just because of this two-thousand-years-old message of Peace and Goodwill to man that we are here. We are helping to bring to a distracted Europe a better and nobler day. Out of all this blood and hate sod strife will ultimately emerge that better state, which is but another mile-stone on the way to that long ago Christmas - promised Peace. The night falls and only the red glare of watch-fires disturb the darkness. Were we back in Old England - we should now be hearing the bells proclaiming the new day. We sleep but intermittently. We awake in the grey dark to find another Christmas morning, fresh and fair, waiting on the old world, There it is, a visible token of peace and goodwill to all the world over. Even the Huns feel it. For them, for a brief space, the spirit of the season seems to overshadow this place of strife. Their guns are silent and across the intervening space no deadly hail blasts away. Far from behind their dug-outs come the softened strains of a military band. There they are celebrating the day with music. Someone daringly suggest that we here attune our voices to a Christmas song. The suggestion is acclaimed, and presently rise the sounds of an old carol, The tones rosy not be so dear nor the notes so well placed as they would be in some great cathedral, but the enthusiasm we show more than compensates for these deficiencies. Our Christmas dinner is now due. It is a regular Barmecide feast, in that it lacks all the regular elements of such a dinner. As a matter of cold fact we simply place our hermetically sealed Mess tins on the stove, open up the lids and fall to. We think of Tiny Tim in the ' Christmas Carol,' and with him say ' God bless us all!' and in this spirit enjoy our dinner as though it were the best of roasted turkey. Today there are no adventures. Yesterday one of our number, going from one dugout to another by way of a somewhat shallow trench did not appear at his destination. Later we found him huddled up in the trench shot through the head. But today: is Christmas and rifles are temporarily laid aside. As the early dark comes down, we set ourselves to enjoy the remainder of a day that will never fade from our minds. Home letters are reread and eyes grow moist over the dear one’s wishes for our safety. We crowd into our little spaces and schoolboy-like, tell stories and recount our adventures until it is time to separate. 1. James Fisher, "Christmas in the Trenches," The Chronicle, 16 December 1916, p. 47. This text also appeared in: the Auckland Star, Volume XLVII, Issue 306, 23 December 1916, Page 1, the Wanganui Chronicle, Volume LX, Issue 17170, 22 December 1917, Page 13, and The Kangaroo Island Courier, Saturday 29 December 1917.